The greedy algorithm assisted with pseudocode. A double version of the greedy algorithm allowing you to observe how different values of t effect the construction. Forcing edges to be in the finished graph is not a problem as you will see in the forced edge applet. Construction of the Θ-graph is visualized in a slide show. A full Θ-graph can be constructed at the web-site of Petra Specht (http://isgnw2.cs.uni-magdeburg.de/~petra/spanner.html). 1. The graph area. Add/remove points by clicking your mouse. 2. Pseudocode of the greedy algorithm. While the spanner is constructed, appropriate parts of the pseudo code are highlighted. 3. The control panel allows you to set t and start the construction of the t-spanner, in steps or in play mode. 4. The status bar will keep you informed of changes in the applet. Twin graph areas makes it possible to experiment with different values of t on the same set of points. Points plottet in one graph area automatically appear i both areas, kepping the two sets alike. Functionality like the above applet. Forcing edges to be part of the graph is not a problem using the greedy algorithm. In stead of starting with an empty set of edges, the forced edges are in the set from the beginning. Functionality like the first applet, with the additional feature that edges can be forced to be in the spanner. 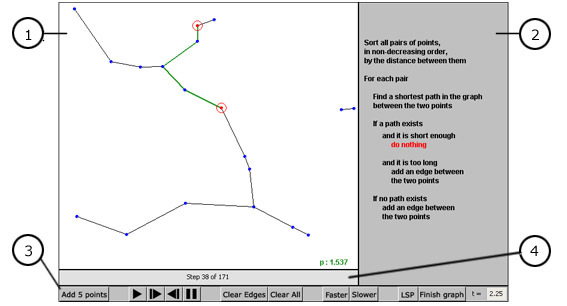 Slideshow visualizing the construction of a Θ-graph. Applet at the website of Petra Specht, University of Magdeburg, Germany.